The Director & Chair – Cardiovascular Surgery, Thoracic Organ Transplantation & MCS in Global Hospital, Chennai, Dr. Sandeep Attawar has over 2 decades of rich professional experience in his field. 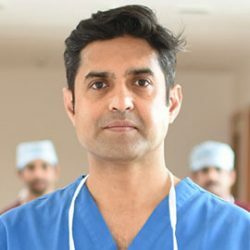 Dr. Sandeep Attawar is one of Indias best doctors in performing complex heart surgeries in neonates to octogenarians. His area of interest lies in the field of Cardiac Failure ; Mechanical Circulatory Support including, Total Artificial Heart (TAH), Ventricular assist devices implantation. Dr. Sandeep Attawar has treated several patients suffering from cardiac diseases in India and gives every patient the best of medical care. Dr. Attawar enjoys the challenge of working in new environments and is driven by a commitment to the development of cardiac healthcare services, both in India and across the world. He takes over as Program Director for Cardiac surgery,Heart & Lung Transplantation,Mechanial circulatory support. His role will allow him to reorient their cardiac services into a more cohesive ,interconnected and uniform care delivery system across a dozen Heart enters in India.